Late last week, Los Angeles Times writer Don Lee reported that, “Despite hopes that a U.S.-China trade deal is at hand, President Trump said Thursday that some key issues have yet to be resolved and that they are not close enough for him to announce a summit with Chinese President Xi Jinping. “Trump said that he should know ‘over the next four weeks’ whether there is a summit or not, quelling speculation throughout the day that he was ready to name the date of a meeting with Xi. ‘If we have a deal, we’ll have a summit,’ he said. Now a summit could come closer to the end of May, or possibly June, when Trump and Xi are expected to attend a global leaders’ summit in Japan. The FT article indicated that, “Mr Liu said ‘we have made great progress,’ crediting the ‘direct guidance by two great presidents,’ according to a transcript of the discussions provided by the White House. Good visit in the Oval Office with @POTUS and Chinese Vice Premier Liu He, no deal yet but POTUS holding firm on a good deal for agriculture. China’s lengthy approval process for genetically modified crops remains a sticking point in talks to end the trade war between China and the United States, according to two sources with knowledge of the talks. “Beijing has taken years to approve new strains of GM crops, which U.S. companies and farmers have complained stalls trade by restricting the sales of new products from companies such as DowDuPont Inc, Bayer AG, and Syngenta AG. The Reuters article explained that, “GM crops and the approval process are still a ‘big issue’ in the discussions, said one of the sources, who spoke on condition of anonymity. “The trade deal, should it be agreed, is expected to include a six-year time frame for purchases of more than $1 trillion in U.S. goods, including commodity products,” the article said. Meanwhile, Gregory Meyer reported on Thursday at The Financial Times Online that, “China has ramped up its purchases of US farm products, providing a goodwill gesture in the midst of talks aimed at ending the year-long trade war — but also reflecting the country’s extensive need for the commodities. “U.S. 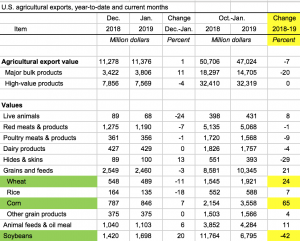 Agricultural Trade Data Update,” USDA- Economic Research Service (March 28, 2019, https://bit.ly/2KN8xmx). 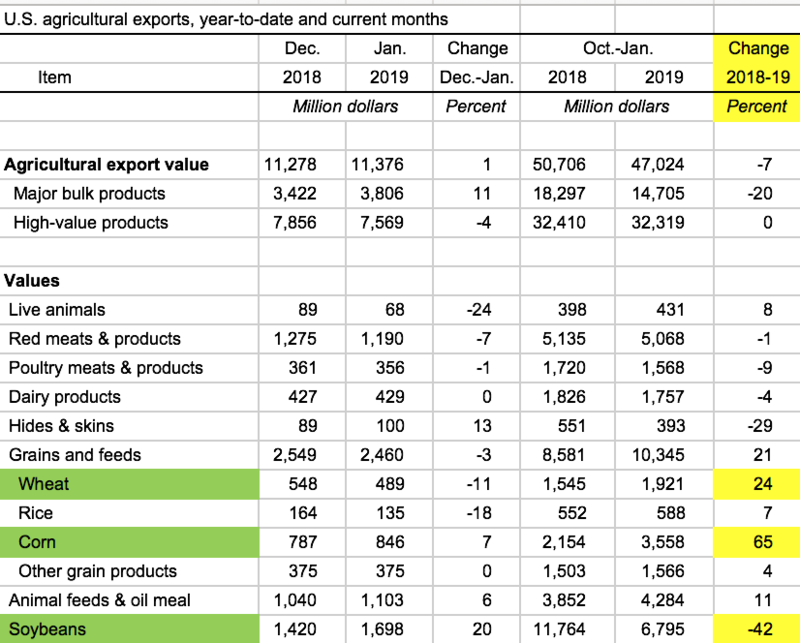 Mr. Meyer also indicated that, “In March, China purchased 24,000 tonnes of US pork, the highest amount in almost two years. The deal came as African swine fever sharply reduced its pig herd, increasing demand for foreign meat even as it slows demand for livestock feed ingredients such as soya meal.